at Eduard Čech Institute for Algebra, Geometry and Physics in Brno, Prague or Opava in Czech Republic. The Eduard Čech center had been established in 2005 and, since 2012, it continues as a national research center focusing its attention to the interaction between algebra, geometry, and mathematical physics. The participating institutions are the Faculty of Science of Masaryk University in Brno, the Faculty of Mathematics and Physics of the Charles University in Prague, the Institute of Physics of the Academy of Sciences of the Czech Republic and the Mathematics Institute of the Silesian University in Opava (see also eci.math.muni.cz). They should also arrange for at least 2 letters of recommendation (one can be from a Czech mathematician) to be mailed directly to rosicky@math.muni.cz before March 15, 2015. The successful applicants will be notified as soon as possible but not later than April 30, 2015. Roger Wiegand: Torsion in tensor products and vanishing of Tor. Sylvia Wiegand: Prime ideals in Noetherian polynomial and power series integral domains. H.-C. Herbig (ECI): Open and solved problems in singular Poisson geometry. November 4, at 3.30pm in the seminar room of Dept. Alg. Abstract: I will talk about applications of the BFV-complex to deformation quantization of singular symplectic quotients. I will indicate why it is necessary to develop a cohomology theory for Lie-Rinehart pairs (A,L) that encompasses also the case when the the A-module underlying the Lie algebra L is non-projective. 11.30 - 12.00 Trlifaj (Co)tilting, (co)filtrations, and (co)localization." Abstract: I will briefly introduce the idea of elliptic cohomology, how it is constructed and why the topic is still alive mathematically. The last part concerns conjectured connections with analysis and geometry which have not been established so far, even though several attempts have been made. The Eduard Čech center had been established in 2005 and, since 2012, it continues as a national research center focusing its attention to the interaction between algebra, geometry, and mathematical physics. The participating institutions are the Faculty of Science of Masaryk University in Brno, the Faculty of Mathematics and Physics of the Charles University in Prague, the Institute of Physics of the Academy of Sciences of the Czech Republic and the Mathematics Institute of the Silesian University in Opava. They should also arrange for at least 2 letters of recommendation (one can be from a Czech mathematician) to be mailed directly to rosicky@math.muni.cz before May 15, 2013. The successful applicants will be notified as soon as possible but not later than June 30, 2013. The Brauer-Thrall Conjectures, now theorems, were originally formulated in terms of representations of ﬁnite-dimensional algebras. They say, roughly speaking, that failure of ﬁnite representation type entails the existence of lots of indecomposable representations of large dimension. These conjectures have been successfully transplanted to the representation theory of commutative local rings. This talk will be a survey of such results, conjectures and counterexamples, for various categories of ﬁnitely generated modules over a commutative Noetherian local ring. The emphasis will be on maximal Cohen-Macaulay modules over Cohen-Macaulay local rings. Abstract: Shelah's celebrated singular compactness theorem asserts that if G is a group whose cardinality is singular, and all subgroups of G are free, then G itself is free. Shelah's proof can be adapted to various other settings, including abelian groups, R-modules, filtered R-modules, colorings of infinite graphs, and transversals of systems of sets. It hasn't been clear whether there is a single statement unifying these applications and their various conclusions. This talk is a preliminary report on joint work with J. Rosicky on what seems to be the "most comprehensive" form of singular compactness. The proof is an adaptation of one of Shelah's arguments to the setting of accessible categories and functors.
. In this talk, we describe prime spectra for some two-dimensional rings of polynomials and power series. This involves our work and work of William Heinzer, Christel Rotthaus, Roger Wiegand and our students. Abstract: The Langlands program is a series of conjectures that provide a common framework for a large part of modern number theory. Its goal is to relate representations of absolute Galois groups of number fields to certain analytic objects, automorphic representations. For example, a special case of this correspondence was proved by Wiles and Taylor as the main step of the proof of Fermat's Last Theorem. In the talk, we will first give an overview and a motivation for the Langlands program, keeping the prerequisited minimal. Then we will discuss some recent asymptotic results on the number of various types of Galois and automorphic representations. For those who are concerned here you can download lecture notes in D-modules by Libor Křižko containing topics of ECI seminars on D-modules from 2011/12. On a complex manifold X, a coherent D-module M admits a characteris­tic variety char(M), a closed conic co-isotropic complex subvariety of the cotangent bundle T*X. On a real manifold M, a sheaf admits a micro-support SS(F), a closed conic co-isotropic subset of the cotangent bundle T*M. In this talk, I will explain both constructions, describe their functorial properties and explain their links. On a complex manifold (X, O_X), an elliptic pair (M ,F) is the data of a co­herent D-module M and an R-constructible sheaf F satisfying the following ellipticity condition: the intersection char(M ) \cap SS(F) is contained in the zero-section of T*X. I will first explain how to recover the classical regu­larity and .niteness theorems of elliptic systems. Then, I will give an index theorem and explain the link with the classical Riemann-Roch-Grothendieck and Atiyah-Singer theorems. I will first recall the construction of the sheaves of holomorphic functions with temperate growth or with exponential decay. These are not sheaves on the usual topology, but sheaves on the subanalytic site. Then I will explain how these objects appear naturally in the study of irregular holonomic D-modules. M. Kashiwara and P. Schapira, Sheaves on Manifolds, Grundlehren der Math. Wiss. 292 Springer-Verlag (1990). M. Sato, T. Kawai and M. Kashiwara, Microfunctions and pseudo-di.erential equations, in Komatsu (ed. ), Hyperfunctions and pseudo-di.erential equations, Proceedings Katata 1971, Lecture Notes in Math. Springer-Verlag 287 p. 265–529 (1973). To any sheaf F on a real manifold M, one associates its singular support SS(F), a closed conic co-isotropic subset of the cotangent bundle T*M, similarly as one associates its characteristic variety char(M) to a coherent D-module M on a complex manifold X. In this talk, I will explain the notion of microsupport of sheaves (with many examples), describe its functorial properties and give some applica­tions to linear PDE and also, if times allows it, to symplectic topology. There will be two extra seminars in week 29.10. - 2.11. on D-modules which will briefly repeat what we did last semester. ECI Workshop in Třešť 19.-20.10. 11.30 – 12.00 Jiri Rosicky Are weak equivalences finitely accessible? More info at AMeGa webpage. Schapira works in algebraic analysis, especially in Sato microlocal analysis, which he combined with concepts of the French analyst school (Jean Leray, Alexander Grothendieck). He worked closely with Kashiwara, whom he met in 1971 in Japan, which was then 1976/77 in Paris, and with which he has published several books. Schapira is now a profesor at Université Paris VI. Three lectures on the topic: PDF. Both work in commutative algebra at University of Nebraska. Topics will be announced later but Sylvia will probably speak about tame-wild dichotomy for commutative noetherian rings. Precise dates of all lectures will be announced later. We are happy to announce a great success that last week in Bielefeld reached the one of the young key members of the Prague branch of ECI Jan Šťovíček. At the ICRA conference, attended by nearly 300 mathematicians and competition from other candidates, Jan became the laureate of the ICRA Award for young talent in the theory of representations. 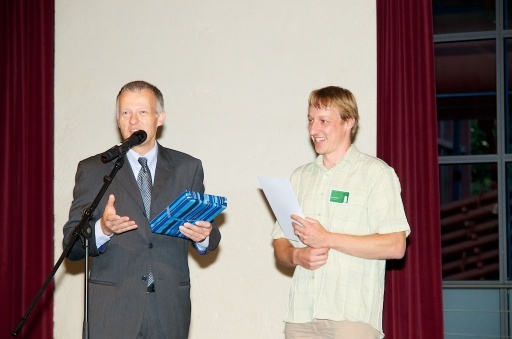 For more info see http://www.math.uni-bielefeld.de/icra2012/icraaward.php. Classic works of Gelfand-Ponomarev and Butler- Ringel have described all finite dimensional representations of string algebras. Attempts at extending the classification to pure-injective representations have led Ringel to formulate a conjecture in the domestic case, saying that the indecomposable pure injective representations are completely determined by two kinds of combinatorial data, called bands and strings. Puninski has recently proved this conjecture in the 1-domestic case. In the ECI Colloquium talk, he will present a general introduction to representation theory of string algebras as well as the main ideas of his proof of Ringel’s conjecture. Monday 25.6. from 15:30: Greg Stevenson (Univ. Bielefeld) Classification problems for triangulated categories. Wednesday 27.6. from 16:00: Ivo Dell'Ambrogio (Univ. Bielefeld) A homotopical look at classical Morita theory. Abstract: Quite recently, Gonçalo Tabuada and I have noticed a rather amusing little fact: there is a very nice Quillen model structure on the category of small preadditive categories, such that two rings become isomorphic in its homotopy category if and only if they are Morita equivalent, in the usual sense. Even better, we can use this to provide conceptual links on Morita equivalence, Picard groups, the Grothendieck group and (working relative to a base commutative ring) the notion of Azumaya algebra. See http://eci.karlin.mff.cuni.cz/events/,,, for more details. The Eduard Čech center had been established in 2005 and, since 2012, it continues as the national research center focusing its attention to interactions between algebra, geometry, and mathematical physics. The participating institutions are Faculty of Science of Masaryk University in Brno, Faculty of Mathematics and Physics of the Charles University in Prague, Institute of Physics of the Academy of Sciences of the Czech Republic and the Mathematics Institute of the Silesian University in Opava (see http://eci.sci.muni.cz). They should also arrange for at least 2 letters of recommendation (one can be from a Czech mathematician) to be mailed directly to rosicky@math.muni.cz before May 15, 2012. The successful applicants will be notified as soon as possible but not later than June 30, 2012.